So tonight, I was totally planning on doing a review on this Mexican restaurant that I went to last week. But to be honest, it wasn’t that great and I was lacking the inspiration necessary to feign interest in the place. Therefore, on a whim, I chose to make my triumphant return to Mama Rita’s in Newbury Park. For those of you who haven’t read the Kitchen Nightmares debacle, check it out now before you jump into my post tonight. So I wanted to originally go back to Mama Rita’s with the crew that we took to the Kitchen Nightmares shoot. But conflicting schedules, plus the fact that Michelle had a baby in the interim (congrats, btw! ), made it a luxury that I just couldn’t afford. I walked into the place at around 7:45pm and was greeted warmly by the owner’s mother. She offered me a table, but since I was all alone, I opted to saddle up to the bar. One of our main complaints last time around was with the service and more specifically, the speed at which things came out of the kitchen. It was a slow night and like I said, I was by myself, but I can tell you that they had chips and salsa in front of me in less than 60 seconds and my meal (shrimp fajitas) was on the table in about 10 minutes. 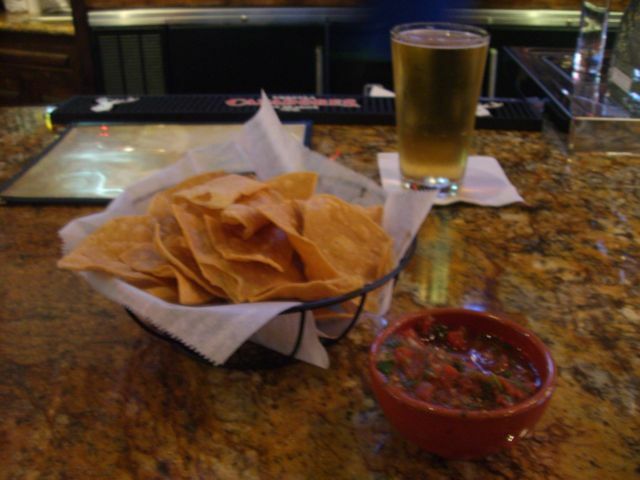 The chips and salsa were a throwback to the days of the old Westlake location. They’ve done away with Gordon’s pico de gallo and brought back their original recipe, which is a great thing in my book. It looks like the menu has also reverted to times of old, but they’ve managed to keep some of the higher quality meats and also borrow some of the spices from successful dishes to incorporate into the less flavorful ones. The last meal I had here was the mahi mahi and if I didn’t do a good enough job expressing my displeasure before, let me take another stab at it. I wanted to order something different than the others at my table, but having to order the mahi was like getting picked last for kickball and then taking a line drive to the face from about 5ft. Needless to say, I couldn’t muster the strength to give it another go. 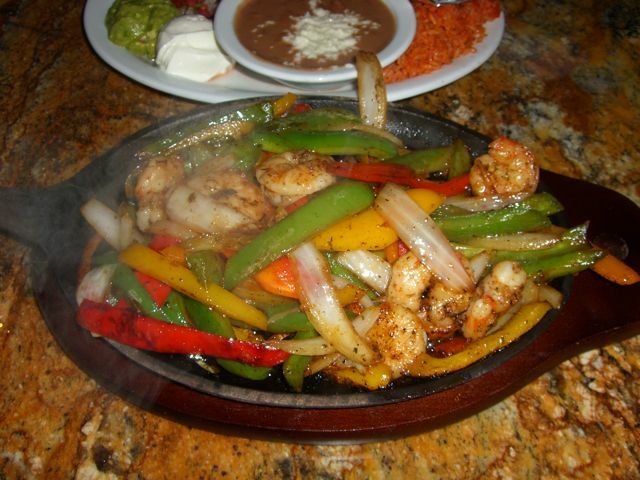 My shrimp fajitas were great. I ordered them mainly because I wanted to see if they’d try to get away with giving me 3 shrimp, like they gave Michelle last time. I was pleasantly surprised to see that my fajitas had a perfectly acceptable 9 shrimp. Not only that, but they incorporated the blackened Cajun flavor that I loved so much in their shrimp tacos. The peppers and onions were also tasty and executed perfectly. The only problem I had with the fajitas was the fact that I couldn’t eat them. You see, they forgot to give me any silverware to work my magic. Once I let the bartender know, he grabbed a setting for me and it was on like Donkey Kong. 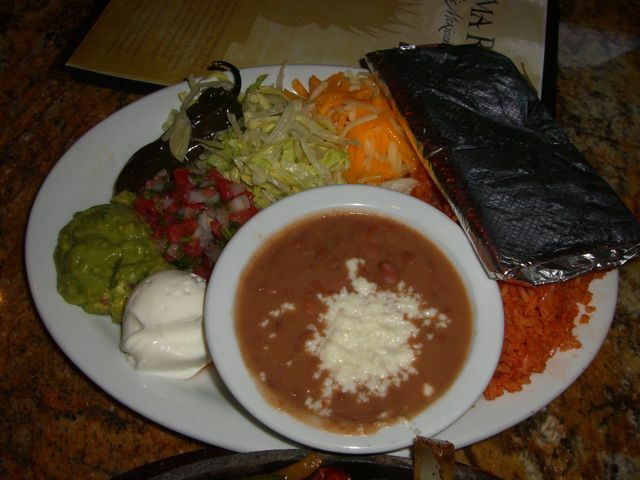 With the fajitas comes a big plate of just about everything you could want: cheese, lettuce, pico de gallo, sour cream, guacamole and of course, beans and rice. They give you your choice of corn or flour tortillas to go with the fajitas and I decided that flour would be the more appropriate choice. Here’s where we get to my other gripe with the meal. 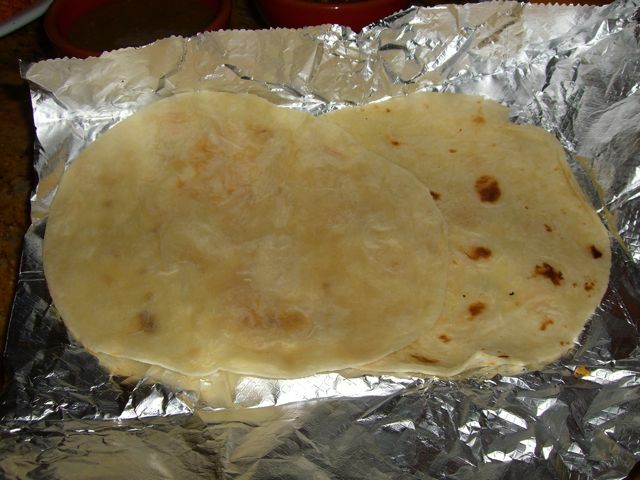 They only give you two tortillas. For all the peppers and shrimp that were on the plate, I needed more eating vessels. It seemed like an honest mistake so I asked the barkeep if this was standard practice. He informed me that it was, but then quickly offered to get me some more tortillas. This made me extremely happy because last time it seemed as though our server, although really nice, had no skills in problem solving. This guy was all over it. He was so on top of his game that he even offered me some of the house hot sauce, which is an awesome green salsa that has a surprising amount of heat. Honestly, that sauce made the dish for me more than any other ingredient. As far as the sides go, the guac was smooth and fresh and I enjoyed it very much. The rice was about a million times better than the flavorless crap that was served on the night of Kitchen Nightmares and the beans were adequate, but not by much. 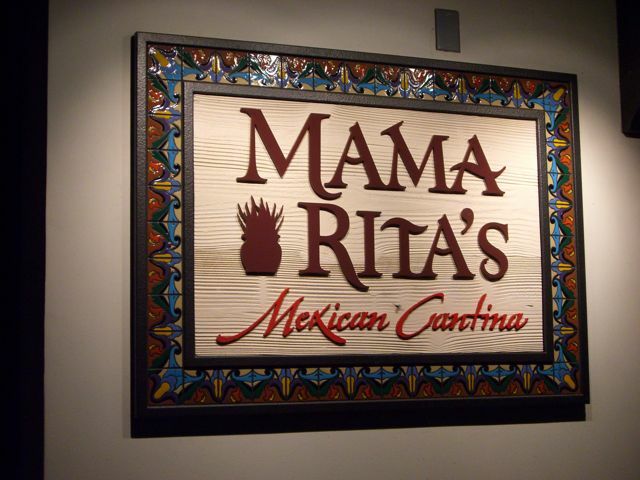 The real improvement though, was the return of Mama Rita’s salsas. Fresh pico is great and all, but a real salsa, like a good cup of tea, has to be allowed to steep and stew in its own juices a little. So just to sum things up, this trip to Mama Rita’s was far better than the first. I don’t think I can adequately judge the service for families or large groups, other than to say if you’re in a hurry, don’t go. The wait staff, while friendly, seems to exhibit little to no sense of urgency in getting you served quickly. I can, however, say that the food has seen great improvement overall and I heartily recommend that you give it another shot if you’ve been previously jilted. Anything with the blackened shrimp is going to be a winner. Sure it’s a little expensive. But it’s the only game in town for Dos Vientos, so what do you expect? My meal, which was a ton of food, plus chips and salsa and my lonely dos equis came out to $23 (before the tip), which I think was pretty fair, all things considered. If they would have tried to give me three shrimp though, we’d be talking about how I punched the cook in the neck, instead of how impressed I am with the strides they’ve made in such a short time. So there it is. It’s safe to go back to Mama Rita’s. I swear, you can even drink the water! Gotta say that I have given Mama Rita’s two tries. Both times the wait time between help was terrible, actually the last time, about a week ago, was worse. The food is bland and lack luster. I love mexican food and this was an unsatisfying experience both times. The people I was with also agree. I didnt help that at the end we had to catch the attention of several waiters then finally ask for our bill. We had been sitting there for a very long time with a clear table waiting to pay and leave. Sorry but they will not get a third try from me. The prices are too high to try over and over for the one time they will get it right. Just one comment… ok maybe more than one. I first wanted to correct you on something. I read the post about going to this place for the shooting, but in that review, you didn’t seem to have a problem with the service. In fact, quite the opposite, I believe you said if anything the service was atentive and yu felt sorry for the owner and the servers who you said were keeping the place together. So I didn’t understand how you started this review by saying how you had problems with the service on the first visit. Sorry, as a career fine dining server, I have seen this happen before and it irks me. IS the place still open or did it finally die by lack of customers or the health department? I must apologize if the post was confusing. When I said that there were problems with the service, I meant in terms of the wait time for food. To wait 2 hours for a main course is pretty bad. Then to have the meal be the opposite of tasty (which my dish was) is obviously going to be frustrating. I’m sure you just saw the Kitchen Nightmares episode, and I think they did a good job of recreating the experience for the most part. When I mentioned that our server was attentive I was being sincere. I was embarrassed for her because nothing was coming out of the kitchen and then when the food did come out (appetizer, entree, etc.) it was disappointing. We were actually the table that they referenced which received the nachos with no beans, no cheese and burned chips. I don’t put that on the server though, the blame lies only with the kitchen. Still, I hope you enjoyed the post. I did just watch the episode, you are correct. I felt bad for the service staff. I mean that poor head waiter actually told Ramsay what not to get, I myself have done that too. I respected the server for doing that. I also totally piked up that you were the table with the nachos, even told my wife that it seemed like this was your table. And those were some sad looking nachos. But hey, on the less sadder second time around, at least you scored the holy grail of “THE NACHO”. I hope you bought a lotto ticjet that night. Thanks for clearing up the service question for me. In my past, when it hits an hour or more, your drinks are comped or at the very least a majority if not all of the food. S I have to ask this though as I have always been curious…. Did you guys have to pay for the food being that you had been invited through a fellow yelper? Also, do you know if the local health departmebt started doing more frequent inspections? I mean when they had the former customers on the show saying why they never went back, well it seemed that 90% of them said they had gotten sick. So I was curious if the health department got ibvolved. Especially since they had meat and chicken stored on high up speed racks which anyone who has worked in a kitchen knows that is a major red multi point violation. I enjoy your site very much by the way. Just saw the episode tonight and wondered if you get invited by the show and if they pay for your food and do the producers interview you afterwards. I see no problem with eating frozen food, as long as it’s cooked properly. If you wouldn’t eat it at a restaurant, why would you eat it at a catered affair? Catering ought to be BETTER than a restaurant. Appently your expectations are low. I agree with Ramsay. If I am going to go and pay to have a meal prepared for me in a restaurant, I don’t want substandard, frozen, microwaved food. As far as I am concerned, food in a restaurant should be superior, and catered food should also be of the highest quality. I’ve had catered food that was horrible, and I wouldn’t want to pay for that either.